Not only have Apple and Samsung appealed certain unfavorable parts of last year's ITC rulings on their complaints against each other (Apple is seeking a broader import ban while Samsung is still pursuing claims over a standard-essential patent) but they still have issues to sort out before the ITC with respect to those investigations. The U.S. trade agency has yet to rule on a pending Apple motion for sanctions (brought in October 2013) against Samsung in the "Patentgate" context. 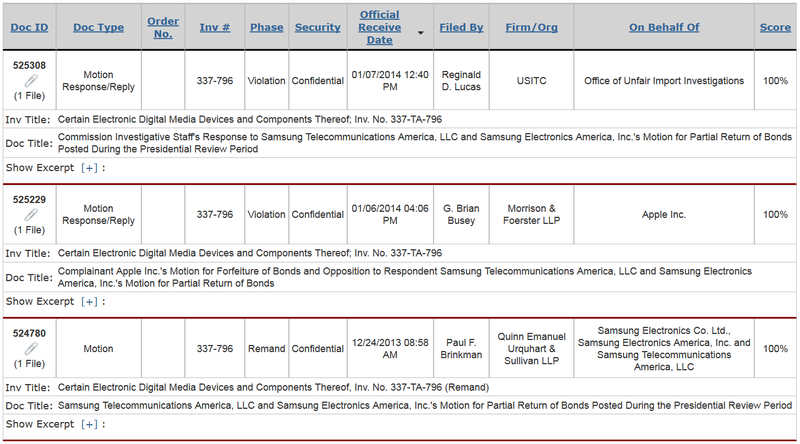 Meanwhile, Samsung wants a partial return of bonds posted during the 60-day Presidential review period following Apple's August 9, 2013 two-patent win. Apple, however, opposes this request for a partial return and pursues the "forfeiture of bonds", which means Apple believes Samsung continued to infringe at least one or both winning patents with one or more products. Even before the ITC ordered the import ban that finally took effect in October 2013, Apple alleged that Samsung had continued to import infringing devices throughout the course of the entire ITC investigation. 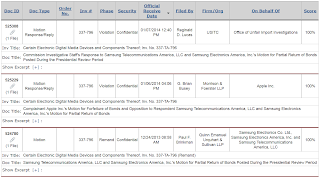 As quickly as possible after the August ruling, Samsung posted a bond (of an unknown amount) with the ITC, which I interpreted as an admission by Samsung that it intended to commit some infringement (or at least acts that could be reasonably alleged to constitute an infringement) during the Presidential review period. Samsung is appealing that decision, so it's possible that it will be cleared of any infringement claims at the end of the process, but for now it has to comply with the ITC ruling. The disagreement between the parties over whether Samsung infringed between early August and early October 2013 does not necessarily mean that there is a dispute over whether Samsung is currently complying with the exclusion order. But the latter is a possibility. If they also disagree on Samsung's currently-imported products, then we will either get news at some point of Samsung shipments being held by U.S. customs or of an enforcement proceeding being instigated by Apple.